My synopsis: Bess Huddleston, an eccentric party planner for New York’s elite, approaches Wolfe with a request; to find the culprit behind letters damaging her image. Wolfe takes on the case at the promise of a hefty fee, but Huddleston dies of tetanus just days later. Archie Goodwin is sure it is foul play and pushes Wolfe to search for Huddleston’s murderer. Cordially Invited to Meet Death is included in The Black Orchids collection. Black Orchids are a small detail of the story and play an important role for Archie during his investigation. His statement at the end of the novel is perfect. It ties everything together but still leaves readers marveling at the mystery that is Nero Wolfe. I enjoy Cordially Invited to Meet Death because of how the murder is committed. The scientific nature is just fascinating and is different, as the novella was written long before the mass production of crime investigation shows. It also perfectly showcases the tumultuous relationship shared by Wolfe and Inspector Cramer. The two worked together in the last novella I reviewed but this time they are left butting heads. Cramer insists on throwing his badge and authority at Wolfe who promptly investigates the murder out of spit! We also get to see the Archie’s frustrations at working with a genius who rarely shares his full thought process. This is not my favorite novella because of the cast of characters. Bess Huddleston just irks me, especially with her menagerie of dangerous pets. I shared Archie’s opinion of Ms. Huddleston’s home. I personally feel that wild animals should not be pets and that most people who have them as pets don’t even have the ability to train a dog, much less a bear or chimp. It may seem harsh but I am sure Wolfe would agree with me. I also wanted to know specific details during the reveal of the murderer, but I can’t go in to that without ruining the story. 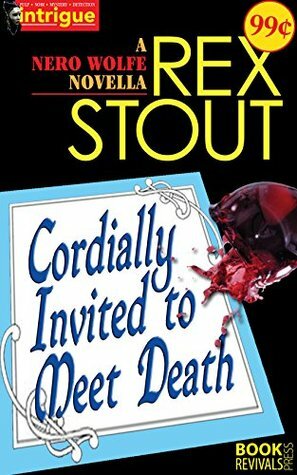 Has anyone else read Cordially Invited to Meet Death? Have I convinced you to check out Nero Wolfe yet?